NOTE: This map is an oversiplification of ocean currents and features in the Pacific Ocean. There are numerous factors that affect the location, size, and strength of all of these features throughout the year, including seasonality and El Nino/La Nina. Depicting that on a static map is very difficult. What is the “garbage patch”? The “garbage patch,” as referred to in the media, is an area of marine debris concentration in the North Pacific Ocean. The name “garbage patch” has led many to believe that this area is a large and continuous patch of easily visible marine debris items such as bottles and other litter—akin to a literal blanket of trash that should be visible with satellite or aerial photographs. This is simply not true. While litter items can be found in this area, along with other debris such as derelict fishing nets, much of the debris mentioned in the media these days refers to small bits of floatable plastic debris. These plastic pieces are quite small and not immediately evident to the naked eye. For more information on this type of debris visit our page on plastics. Where is the “garbage patch”? There has been recent media mentioning both an eastern and western “garbage patch”. The eastern “garbage patch” is the same as the original garbage patch (see above), located approximately mid-way between Hawaii and California — the area of the N. Pacific Subtropical High. The western garbage patch is noted to be located off the coast of Japan. What is the western “garbage patch”? There is a small “recirculation gyre” south of the Kuroshio current, off the coast of Japan that may concentrate floating marine debris — this so-called western “garbage patch”. The exact forces that cause this clockwise rotation are still being researched; however it may be caused by winds and ocean eddies (clockwise or counter-clockwise rotating waters). Research is ongoing by academia such as the University of Hawaii and Massachusetts Institute of Technology, to further understand the true nature of and forces behind these recirculation gyres. Is the “garbage patch” the only area where marine debris concentrates? NO. There are several features within our oceans that concentrate marine debris, including oceanic eddies and convergence zones. See below and our page on Marine Debris Movement for more information. ANOTHER EXAMPLE is an area known as the North Pacific Subtropical Convergence Zone (STCZ). The STCZ is located along the southern edge of an area known as the North Pacific Transition Zone (click here for detailed information on the Transition Zone). NOAA has focused on the STCZ because it is an area of high productivity, pelagic species feeding and migration, and documented marine debris concentration – and one of the reasons for marine debris accumulation in Hawaii (see below) (Kubota, 1994; Pichel et al., 2007). This area does not have distinct boundaries and varies in location and intensity of convergence throughout the year. This zone moves seasonally between 30° and 42° N latitude (approximately 800 miles), extending farther south (28°N) during periods of El Niño (Donohue and Foley, 2007). It is less well defined and located more northerly during the summer months, when convergence tends to be weaker, and is sharper and located farther south during winter months, when convergence is stronger. The Hawaiian Archipelago, extending from the southernmost island of Hawaii 1,500 miles northwest to Kure Atoll, is among the longest and most remote island chains in the world. In Hawaii, marine debris continues to present a hazard to marine habitat, safe navigation, and wildlife, including the endangered Hawaiian monk seal (Monachus schauinslandi) and various species of sea turtles, seabirds, and whales. It is the location of this archipelago, between 18° and 28° N latitude, which makes it prone to the accumulation of marine debris. One of the reasons marine debris accumulates in these islands is the movement of debris within the North Pacific Subtropical Convergence Zone (STCZ). The STCZ concentrates debris and moves seasonally between 30° and 42° N latitude, dipping farther south (28°N) during periods of El Niño. This accumulation due to the STCZ is evidenced by an increase in the quantity of floating marine debris deposited on beaches during El Niño periods (Morishige et al., 2007). Additionally, a correlation has been noted between increased entanglements of endangered Hawaiian monk seals in marine debris and periods of El Niño (Donohue and Foley, 2007). What is the difference between the “gyre” and the “garbage patch”? Or are they the same thing? A gyre is a large-scale circular feature made up of ocean currents that spiral around a central point, clockwise in the Northern Hemisphere and counterclockwise in the Southern Hemisphere. Worldwide, there are five major subtropical oceanic gyres: the North and South Pacific Subtropical Gyres, the North and South Atlantic Subtropical Gyres, and the Indian Ocean Subtropical Gyre. The North Pacific Subtropical Gyre is the one most notable because of its tendency to collect debris. It is made up of four large, clockwise-rotating currents – North Pacific, California, North Equatorial, and Kuroshio. It is very difficult to measure the exact size of a gyre because it is a fluid system, but the North Pacific Subtropical Gyre is roughly estimated to be approximately 7 to 9 million square miles—not a small area! This, of course, is a ballpark estimate. This is equivalent to approximately three times the area of the continental United States (3 million square miles). While a gyre may aggregate debris on a very large scale, debris patches, as seen by those sailing the North Pacific, are actually the result of various smaller-scale oceanographic features such as oceanic eddies and frontal meanders (think of meanders as the deviation from a straight line. As energy (wind/currents) hit the front there are undulations and “curvature” which are described as frontal meanders (movements to the north and south along the front)). How big is the “garbage patch”? There has been extensive media coverage about the “garbage patch” over the past couple years; however, its reported size and mass have differed from article to article. Due to the limited sample size, as well as a tendency for observing ships to explore only areas thought to concentrate debris, there is really no accurate estimate on the size or mass of the “garbage patch” or any other concentrations of marine debris in the open ocean. Additionally, many oceanographic features do not have distinct boundaries or a permanent extent, and thus the amount of marine debris (both number and weight) in this zone would be very difficult to measure accurately. The “patchiness” of debris in this expansive area would make a statistically sound survey quite labor-intensive and likely expensive. Regardless of the exact size, mass, and location of the “garbage patch,” manmade debris does not belong in our oceans and waterways. Can you see the “garbage patch” with satellite photos? NO. Relative to the expanse of the North Pacific Ocean, sightings of large concentrations of debris, especially of large debris items are not very common. A majority of the debris observed in the “garbage patch” is small plastic pieces. Small debris pieces are difficult to see due to their size, and many of these pieces may be suspended below the surface of the water, which would make them even harder to see, even with the human eye. For these reasons, the debris, or “patch” of debris is not visible with existing satellite technology. What is being done to clean up the plastics and debris in the “garbage patch” and greater North Pacific? NOAA has also been contacted regarding cleanup of the debris in the “garbage patch” and other areas of the North Pacific; however, cleanup is likely to be more difficult than it may seem. In some areas where marine debris concentrates so does marine life, such as in the STCZ. This makes simple scooping up of the material risky–more harm than good may be caused. Remember that much ocean life is in the microscopic size range. For example, straining ocean waters for plastics would capture the plankton that are the base of the marine food web and responsible for 50% of the photosynthesis on Earth… roughly equivalent to all land plants! Also, because this area moves within the North Pacific Ocean (a very large area), one can imagine the difficulty in finding large concentrations on a given day. NOAA is working to use oceanographic information to help predict the areas of convergence that are likely to concentrate debris. Large-scale oceanographic processes that lead to convergence in the North Pacific Subtropical High and STCZ are thought to also bring together marine debris. However, these concentrations of marine debris are still very difficult to predict in location or to find while at sea due to the vastness of the North Pacific. If we can develop a better understanding of the medium- and small-scale oceanographic processes that may concentrate marine debris in certain areas, we may be able to pinpoint local higher concentrations of debris. Current knowledge and resources do not provide enough confidence for cost-effective, successful removal efforts. NOAA and our partners have been removing marine debris from the Hawaiian Archipelago for over a decade. Our focus has been on the larger debris items like the derelict fishing nets, which have been shown to be extremely hazardous to navigation, corals, marine mammals, and other marine animals. Since 1996, over 600 metric tons of derelict nets have been removed from the remote Northwestern Hawaiian Islands. To date, no removal operation has been initiated to remove the smaller bits of debris. A more comprehensive study on the locations, composition, abundance, and impacts needs to be conducted on the smaller pieces in order to develop the most effective and efficient removal operation, if warranted. Is there a “garbage patch” in the Atlantic Ocean? Much of the research on oceanic movement and concentration of marine debris has focused on the Pacific Ocean, possibly because these mechanisms lead to the accumulation, and thus impacts, of marine debris across the Hawaiian Archipelago. In particular, research has been done on the North Pacific Subtropical Convergence Zone, a known area of debris accumulation in the North Pacific. Additionally, perhaps due to the numerous protected species and resources within the Hawaiian Archipelago (e.g., endangered Hawaiian monk seal), research on threats, such as marine debris, tend to rise in priority. This is not to say that marine debris in the Atlantic Ocean is not important. There has been research conducted and published on marine debris in the Atlantic, mainly on ingestion in Atlantic species of sea turtles and seabirds or on nearshore trawls for plastic particles. Still, there is a paucity of literature on marine debris in the high-seas Atlantic Ocean. Much like in the Pacific, there is a North Atlantic Subtropical Gyre made up of four major currents – North Equatorial, Gulf Stream, North Atlantic, and Canary Current. There is also a North Atlantic Subtropical Convergence Zone (STCZ); however, while it has been predicted to concentrate debris, we currently know of no research on debris concentration within this STCZ or of the existence of a notable “garbage patch”. Donohue, M. and D. Foley. 2007. Remote sensing reveals links among the endangered Hawaiian monk seal, marine debris, and El Niño. Marine Mammal Science 23(2):468-473. Morishige, C., M. Donohue, E. Flint, C. Swenson, and C. Woolaway. 2007. Factors affecting marine debris deposition at French Frigate Shoals, Northwestern Hawaiian Islands Marine National Monument, 1990-2002. Marine Pollution Bulletin 54: 1162-1169. Pichel, W., J. Churnside, T. Veenstra, D. Foley, K. Friedman, R. Brainard, J. Nicoll, Q. Zheng, and P. Clemente-Colon. 2007. 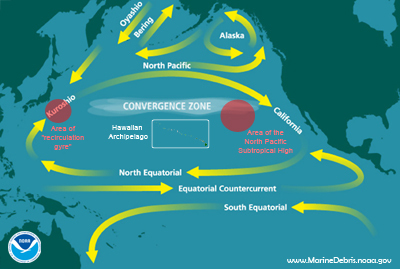 Marine debris collects within the North Pacific Subtropical Convergence Zone. Marine Pollution Bulletin 54: 1207-1211. This information was compiled with the input and assistance of NOAA researchers, Hawaii longline fishermen, recreational boaters, and in particular oceanographers with the NOAA Pacific Islands Fisheries Science Center. I am searching for informations on the South Atlantic “Garbage Patch”. I have been doing some research on drifting on FMD on the SE coast of Brazil, close to the Tropic of Capricorn and I would like to have some info on this subject. Could you steer me on the right direction?